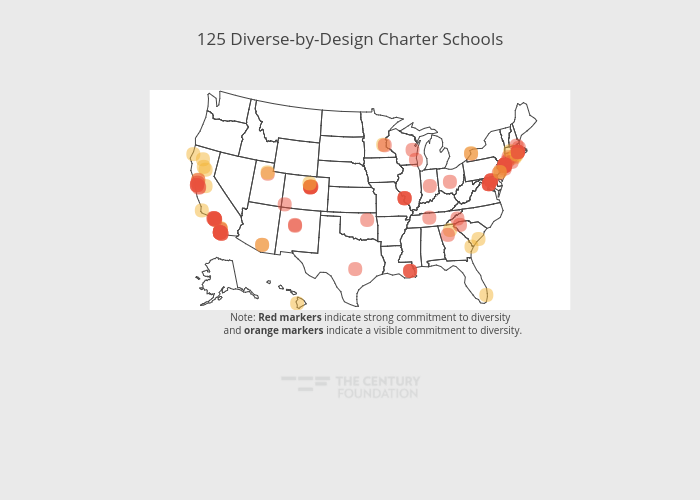 Thecenturyfoundation's interactive graph and data of "125 Diverse-by-Design Charter Schools" is a scattergeo, showing D. The x-axis shows values from 0 to 0. The y-axis shows values from 0 to 0. This visualization has the following annotation: Note: Red markers indicate strong commitment to diversity &lt;br&gt; and orange markers indicate a visible commitment to diversity.